Sometimes you already have the perfect lighting for your home and you just want to add motion sensing functionality. With this DIY motion detector Kit you can make any light motion sensitive. There are a few other such kits out there, but this one has some nice features. It is designed so you replace your existing wall switch with the one provided (anyone moderately handy ought to be able to handle this). The motion sensor itself is battery powered (two AAA batteries which should last quite a while), and you can just attach it wherever it is you want to detect motion, as long as it is within a hundred feet of the outdoor lighting. Motion sensor doesn’t need any wiring. There are some big advantages to being able to set up the motion sensor away from the light. For one, it allows you to hide the sensor where it won’t be visible to vandals at nitght when the light comes on. It is also a great way to keep June bugs, may beetles, moths, and other insects from circling the light and continuously triggering it. The unit works with lights up to 300 watts, and has a dimmer switch with five levels of brightness (won’t work for fluorescent bulbs, but you shouldn’t put them in motion lighting anyway). The energy saving nature of outdoor motion lighting combined with the dimmer switch reduces the need for energy efficient outdoor light bulbs. It has a dusk mode option which can turn the lights on at a low level for a few hours after dusk. They will brighten to full if motion is detected. 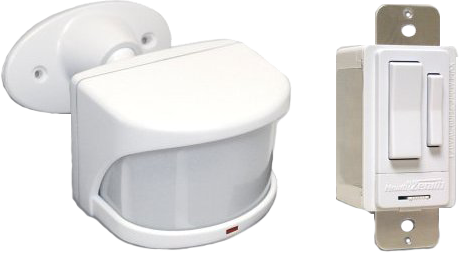 Due to all the features, this product isn’t really cheaper than a normal outdoor motion detector light, but wireless motion detectors give you the flexibility to use the lighting of your choice and place the motion sensor out of sight. It is sensitive to a 240° angle and does have a sensitivity adjustment. When you turn the main switch on, the light stays on. When you turn it off, it is in motion sensor mode. The individual product numbers on these two components are : SL-6017 for the switch, and SL-6032 for the motion sensor. 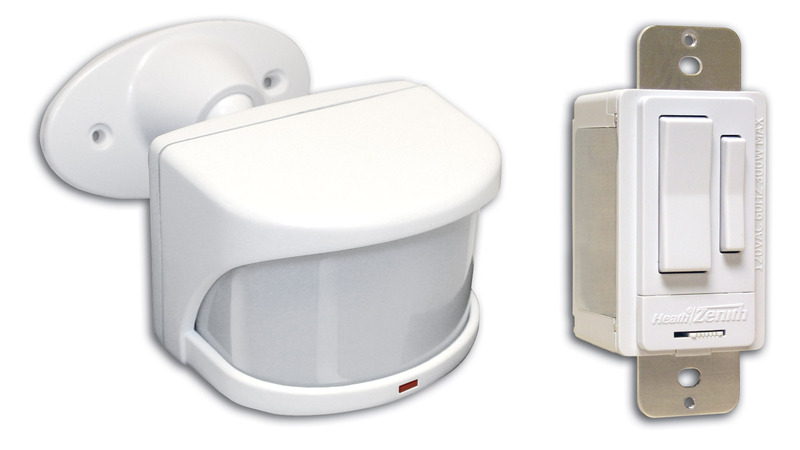 Heath/Zenith Motion Sensor tends to have prompt customer service. This switch is intended for single pole switches, which means that it is the only switch that controls the light. If there are multiple switches for the light, you need the 3 way version of the switch (SL-6023 ) instead of the 6017. You can get the whole single pole switch and motion sensor kit on amazon. Or a bit cheaper through Plumber Surplus. They tend to have good promotions as well.